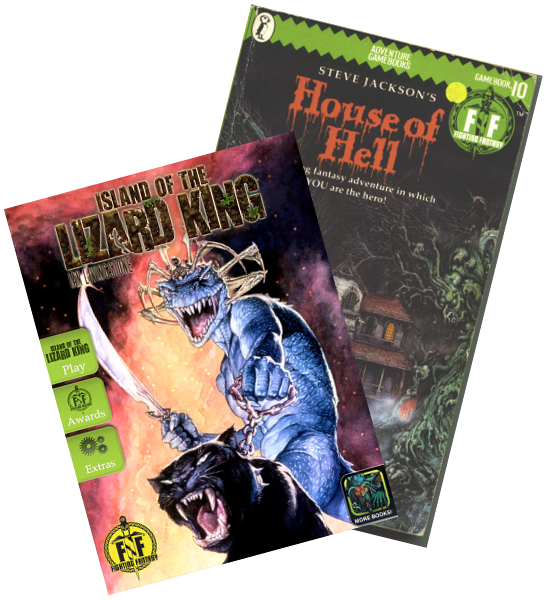 The Fighting Fantasy gamebooks were one of my earliest introductions to interactive media that wasn’t just videogames. That is to say, I didn’t realise it at the time, but I discovered proto-videogame design after discovering videogames. Simply put, the Fighting Fantasy model works in a model reminiscent of Twine; you have a passage of text, marked with a number, and sequences can direct you to read another passage by directing you to another number. It’s such a rudimentary idea, a simplistic program; if then go to else. There’s some memory in the Fighting Fantasy books, and some dedication to themes that lacked in Choose Your Own Adventure books (which were often just dream logic). These systems created part of its framework; broadly speaking, you were a lone adventurer opposing things and you could be worn down by damage or your individual skill (or luck) could be used to influence the narrative. The idea of these systems allowed for the character to die, for the story to end without the story ever telling you it was at an end – because your character had taken their last two points of STAMINA damage reaching into a grate because you were hoping you might find a healing potion rather than a rat that bit your hand. This is one of the simplest ways a person with an eye towards narrative can make a game structure. Twine lets you do it, too, and Twine can even let you offload a lot of the data, but thanks to Twine’s current expression, the incentive can exist to be a bit… small. To go for intimate and expressive rather than epic and sweeping. Another thing that fascinates me in hindsight was the ways the games dealt with memory. In one series of these books, the Sorcery line, your character was a wizard who knew and learned spells. How were they going to represent that? Well, rather than a system of words on your sheet you could check against, the game started by presenting you with a spellbook, where every spell was a 3-letter key phrase and described what it did. You read this section once, and by the rules, you did not read it again. When you had opportunities to cast spells, the game would present you with a list of three-letter words and a number to turn to, many of which were failure states that simply said ‘that’s not a spell.’ This meant that to cast a spell, you, the player, both had to know what the spells did, and what their code to reference was and be confident enough that it would do what you wanted to do. This is an interesting idea because it uses the plasticity of human memory to represent, well, the plasticity of a character’s memory. Another thing I don’t remember the Fighting Fantasy books doing but I imagine it could is a system where your character has access to a common function that they can do by executing a mathematical equation on the number of entry you’re at, and then jumping to that new section. This idea seems mathy and fiddly, and I’d need to talk to a mathemetician about it, but it strikes me as an interesting idea for exploring new space in this cardboard coding.